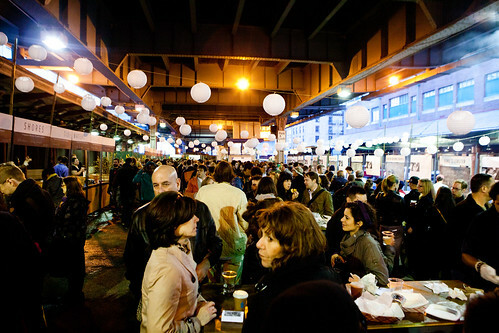 This past Saturday, April 9, 2011, I was invited to shoot for New Amsterdam Market‘s fundraiser food event, Oyster Saloon. If you haven’t visited New Amsterdam Market before, I highly suggest you to do so. They have local farmers, purveyors, distributors, cooks, bakers, mongers, and chefs within the New York tri-state area that source locally and create (or grow) amazing food products. I attended the Market Founders Circle event (where admission started at $200) while the public event, Oyster Saloon, started during the first hour. I listened to the distinguished, former New York Times’ food critic Mimi Sheraton gave a speech to toast this event with the theme of oysters. It was historical, intertwining New Amsterdam’s mission to the old Fulton Fish Market, as well as light-hearted and humorous sprinkling of anecdotes of famous oyster eaters in the late 19th century. 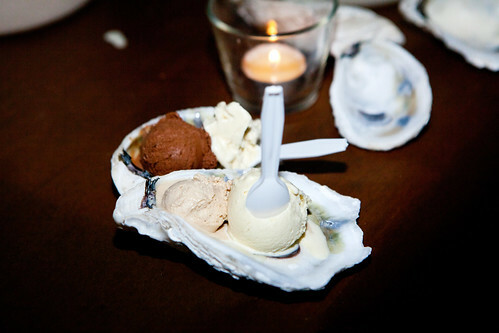 My absolute favorite bites from that particular party (or both events) was The Bent Spoon‘s savory ice creams based on oyster stews. One pair I remember vividly was a pairing of Meyer lemon and Cape May Salt Oyster ice cream with a scoop of chocolate, balsamic vinegar with cippolini onion. 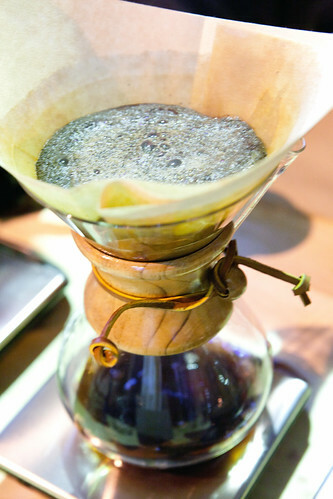 It’s mind bending, crazy delicious. If they were selling it and I had dry ice, I would seriously buy myself a pint each. 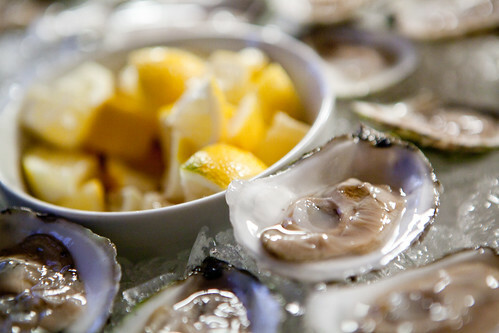 The Flying Oysters from Maine were light, sublime and distinctively briny. This high-ticketed item (worth 4 tickets, while other restaurants’ dishes were 2-3) from the Oyster Saloon was Chef April Bloomfield from The John Dory‘s pan roast. 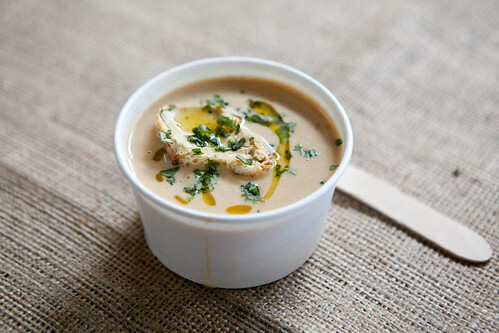 This luxuriously cream-based soup filled with three plump oysters, finely minced shallots, floated with a toast slathered with uni butter. Sprinkled with fresh herbs and a squirt of olive oil. This serving seems small to the eye but this dish is rich and robust with flavors that you don’t need a huge bowl. It’s briny, richer than soup but thinner than stew, with a twang of spiciness, and a bracing end note of lemon. The uni toast gently reinforced the briny flavors of the sea. Yes, this was worth the four tickets. This oyster po’boy sandwich from Neuman’s Catering was the first to sell out. Word of mouth spread amongst the hungry hordes that this was the best valued dish. 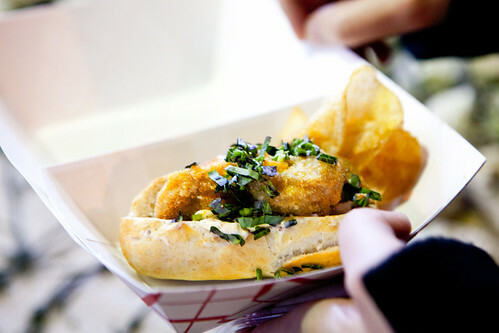 A tasting-sized sandwich of fried oysters in a roll, sprinkled with fresh herbs and served with a side of potato chips. Even though this event had a great trio of beers to choose from sourced by Beer Table: Sixpoint Brewery’s Harbinger Saison, Brooklyn Brewery’s Best Bitter and Barrier Brewery’s Pale Ale, I have to stick with my beloved cup o’ joe from Blue Bottle Coffee. 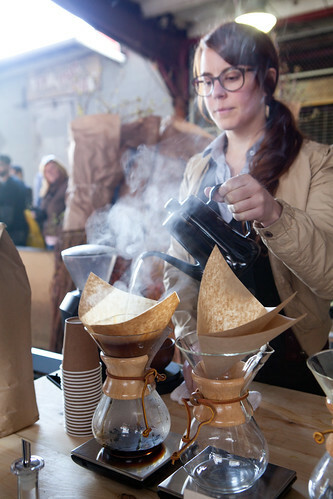 In most food events I’m noticing these days, they’re serving it up Chemex style with single origin coffee. As always, it’s flavorful, rich and dark. They also did serve gingerbread in paper muffin liners. Those were dense, very moist cakes with a swift kick of ginger and cloves. Overall this was a pretty good experience for their first food event of this size. 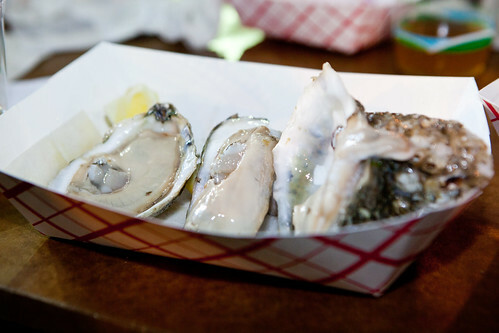 Good food choices (that’s if you like or love oysters), great beer, and lots of people to mingle with.